The Vortex Razor Red Dot has certainly garnered a considerable amount of attention recently thanks to its overall performance. The pistol version of this red dot sight model is certainly interesting. Small, compact and powerful, the Vortex Razor Red Dot certainly has a lot to recommend. 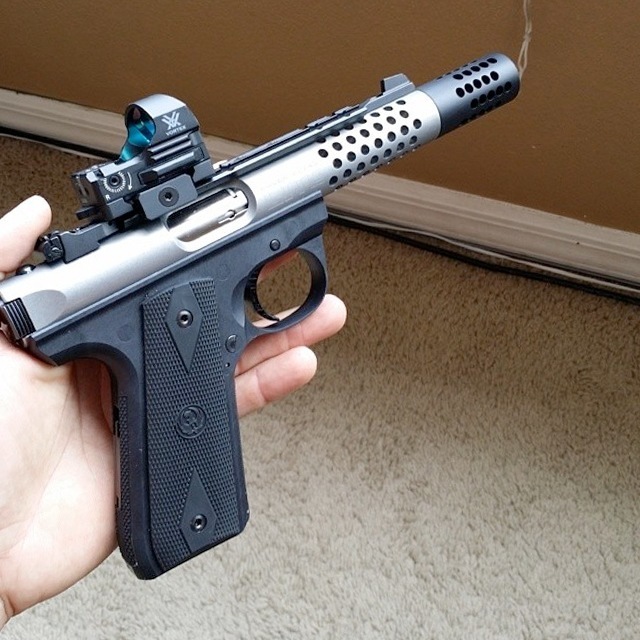 For this review, the Razor was mounted in a standard, factory pistol mount with the mounting plate itself replacing the rear sight. The Razor was bolted to the mounting plate which may not be ideal, but it is rather inexpensive and allows the shooter to quickly get on with testing out just how the Razor performs in all types of target situations. 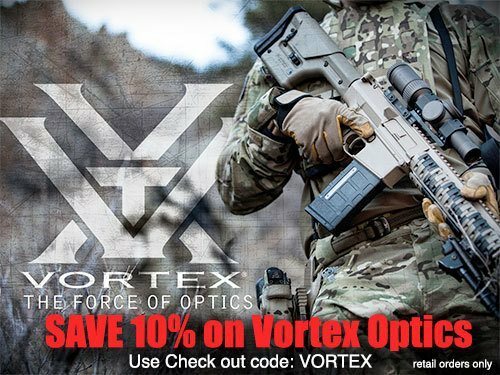 There are a number of noticeable features of the Vortex Optics Razor Red Dot. Arguably the most apparent is the very solid construction thank to the aviation-grade aluminum used for the casing. The thick hood and durable construction means that it can easily hold up to the elements and the normal bumps, scrapes and drops from handling. The red dot itself is quite brilliant and works even in very bright sunshine. Plus, you can really see it at night on the highest level which means that you may want to turn down the brightness if you don’t want it to cause any attraction. The battery will last for one year on the highest setting, although be warned that there is an automatic shut off feature after six hours. Unless you are constantly tracking, this should not be an issue. In addition, the Razor is quite compact as well, making it perfect for pistol-mountings as its lightweight and durable construction are perfect for handguns. Also, there is a special coating on the lens to help enhance the overall acuity of the laser. It does give off a blue tint as it is suppose to block reflections as well. Overall, the feel of this laser is more of a magnified optic than a true single red dot. Still, it does work quite well and is definitely a performance-oriented type of device. One of the lesser qualities about the Razor is that the dot can be blocked by all types of dirt, debris, water and anything else that sticks to the emitter. This is really not desirable for those who want to operate out in the open where it can be exposed to the elements. Another problem is that the adjustments are right next to the emitter itself, meaning that it can be easily blocked by your own fingers while trying to adjust the device. This can be a significant issue and it is one reason why back up sights play an important roles in such devices. Finally, the adjustment dials are rather unimpressive for such a device. Overall, they have a “mushy” feel that can make getting precise adjustments a little difficult. It doesn’t help that it all requires a tool to work with which can be a little difficult if you are out in the country. There is a natural adjustment period between the time that you first start using the Razor and the time where you can lock into the target. This is a natural process since it does take some adjustment, especially when firing pistols. It is recommended that you start with relatively close targets from 7 to 10 yards in order to get a good feel of how the targeting really works. You may find that the Razor will make your pistol shooting more akin to rifles instead. One observation is that the entire system of red dot, targeting and shooting with pistols works better with both eyes wide open and focused on the target itself and not just on the dot or on top of the front sight. The goal is to pull the trigger without moving the dot and once you succeed consistently, you can then really enjoy the benefits of this particular laser system. In some ways, the Razor is rather merciless with your own shooting ability. You must be precise in order to get the most out of this remarkable system. After a series of shots, you will want to gradually make adjustments for windage, but overall you should find yourself putting each rough through the same hole repeatedly. The Razor really punishes laziness, so it is important to focus on each shot until using the device becomes second nature. However, once that happens it can be a real blessing as you place each round in the target with greater ease. Plus, it helps you train to become a better marksman and improves your overall targeting skills as well. As much as it helps you find the target, it may actually be a better teacher instead. Despite the fact that the Razor is quite light, it still does weigh enough to slightly throw your weapon off target if you allow for that to happen. You may also want to change out your ammunition in order to find something either lighter or heavier so you can better control your pistol. Admittedly, if the Razor was mounted differently using the more expensive method there probably would have been different results as well. However, the entire purpose of the Razor is to provide for more accurate shooting, especially in indoor or controlled conditions which means that as long as it is mounted properly, it should deliver on its promises. One nice aspect was that some of the spent cartridges actually struck the optic hood of the Razor and had little effect beyond a few dings. This is a device that can certainly take the punishment over time, although if it can be avoided, it should. Overall, if you are looking for a laser that can put a dot on the target and actually help improve your skills, then the Razor is definitely the one for you. It does have its problems, namely with the positioning and feel of the adjustments which could have been done better. However, once it is locked in the Razor performed beautifully and certainly was well worth the effort and price for this device. Made especially for those who want a red dot for their pistol or handgun shooting, the Razor is one of the better lasers on the market today.